With a ridge of high pressure out in the Atlantic and RASP indicating plus 3 and beyond by late morning there was everything to play for today. And that didn't apply to just us, even the animal kingdom got in on the act as, whilst we we towing out the gliders, we were greeted by the sight of a young deer grazing by the south boundary! It remained intent on feeding until we got quite close before deciding to bolt into the gorse by the eastern trailer park from which, try as we might, we couldn't extricate it. So should we stop flying until we could be sure it was not going to cross the runway? 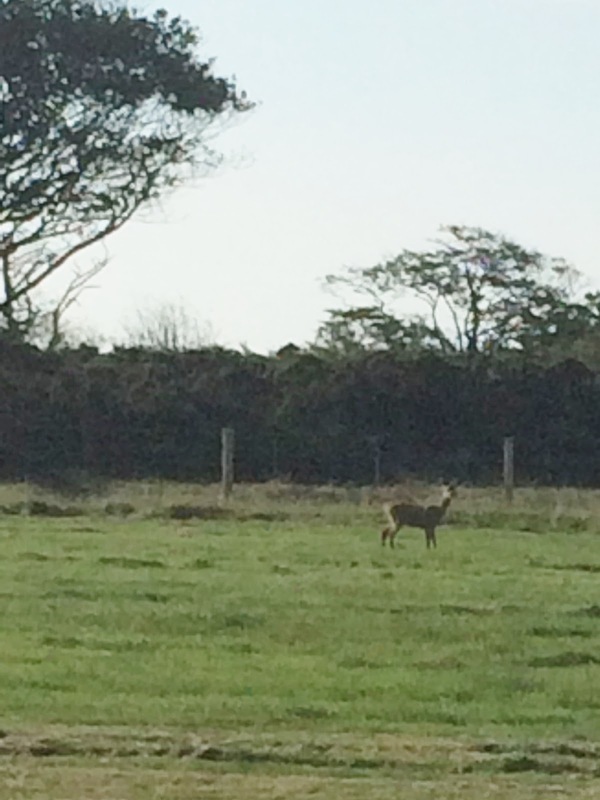 Or should we, as Paula Howarth succinctly put it: “Play it by deer..!” (We didn't see it again). Bambi: ...a young deer grazing by the southern boundary..! The day positively blossomed with cu, quite low at first, in lines from SW-NE from about 1130 onwards, allowing One Day Course student Craig Davidson and other trainees to be given extended flights from the start. Today's IFP, Roger Appleboom, had a very busy time, not only with Craig, but flying with visitors David Westcott, Peter Fordham, Barry Lavers and Leanne King. We also welcomed reciprocal aviators in the shape of Henry Ford, from Mendip, and Vincent Radley, from the Mynd, to the delights of flying at Brentor (indeed Henry shared second equal place for Flight of the Day with Paula Howarth at 24 mins (K-8) – the winner being Richard Roberts with 30 Mins in his K-6CR). Driving Test Examiner Leanne King gave Roger a ‘Pass’! Visitor Peter Fordham prepares to fly with IFP Roger Appleboom. from the cockpit of the K-8 at 2,300ft agl. Paula Howarth in training to drive the winch. Monday – 8:15am, in the briefing room to meet our course mates and reacquaint ourselves with the quirks of the Aston Down airfield (I.e. Don't land in the crop!) 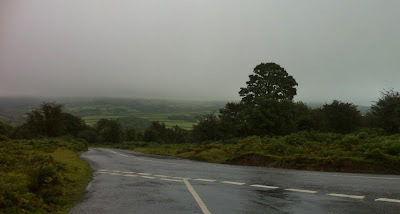 We weren't in any rush as it was wet and foggy. 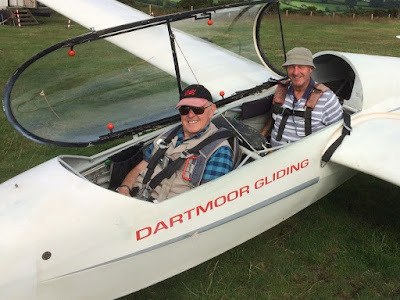 Aims of the week discussed, weather, RASP and NOTAMs studied and the optimistic approach adopted that this weather WILL clear – because that's what all glider pilots do – it was time to get the toys out. 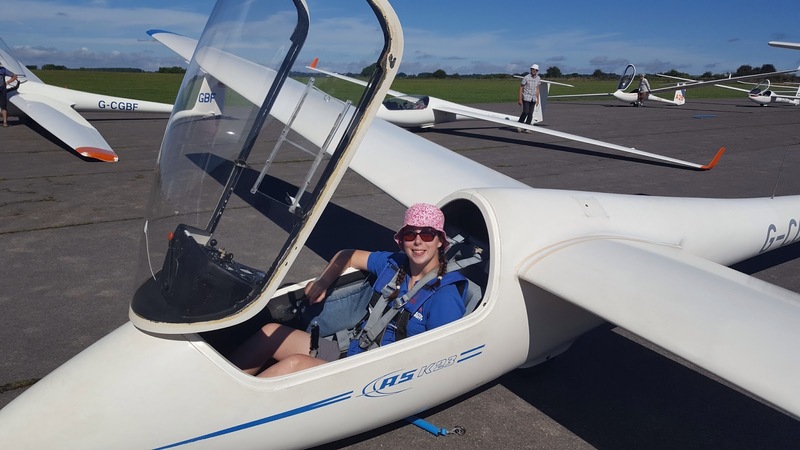 Having being used to our trusty wooden gliders of the K13 and K8, I was really excited to get to grips with the glass fibre K21, one of the club dual training aircrafts, and the K23, the single seater. This was the first aim of my course: to convert to glass fibre. At the launch point, the question was who's going to test the cloud base? And guess who drew the short straw… Me! 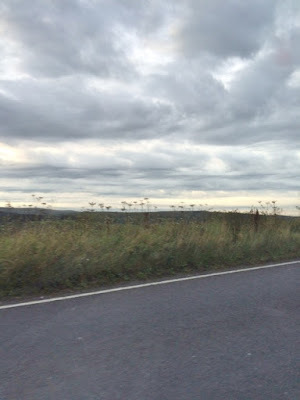 A quick briefing on what to do when launching into cloud and it was time to go. We launched and before long Don and I were in cloud at 800ft, but we held on to 900ft to do the cloud exercise – release under tension, open the air brakes and wait until we see the ground. 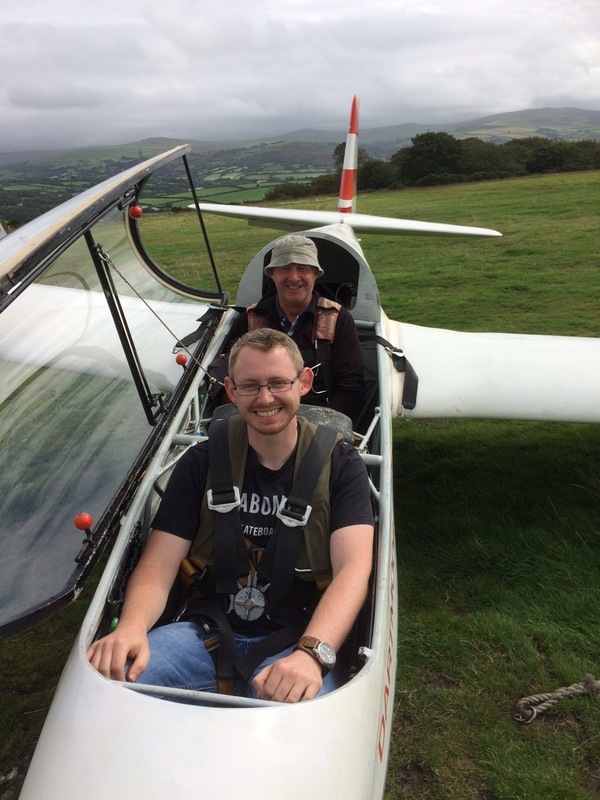 My week of flying had begun and just 6 flights in, it was a great feeling to know that Don wanted to send me off solo… Shame the ruddy cross wind was a tad too strong! 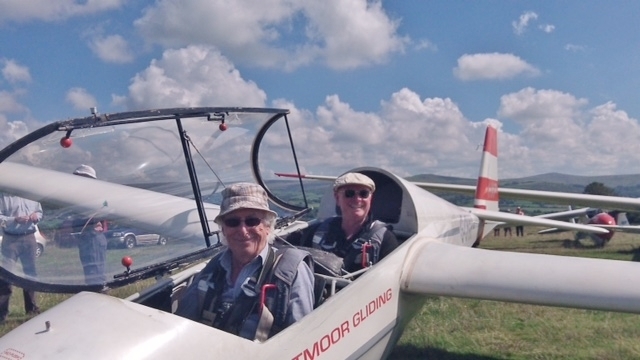 Dad had a couple flights in the K23 to familiarise himself with the airfield once again. 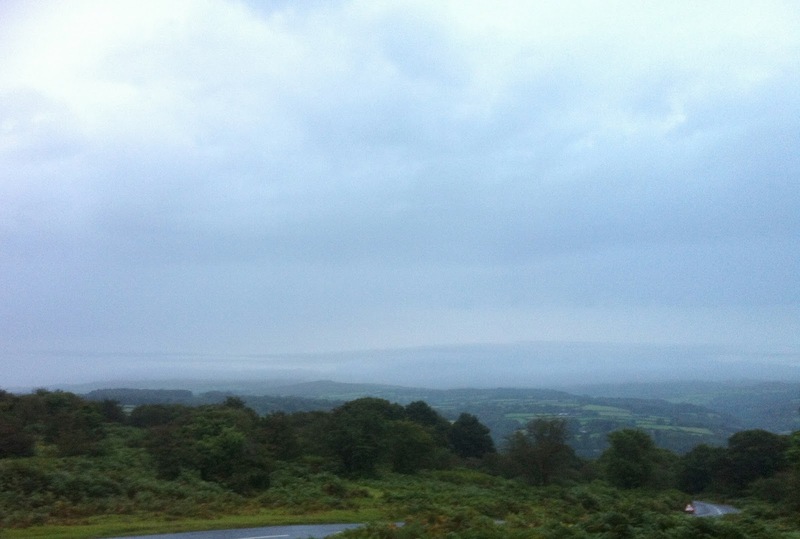 Tuesday – conditions were better although the crosswind was still pretty strong. So it was more of the same as yesterday. 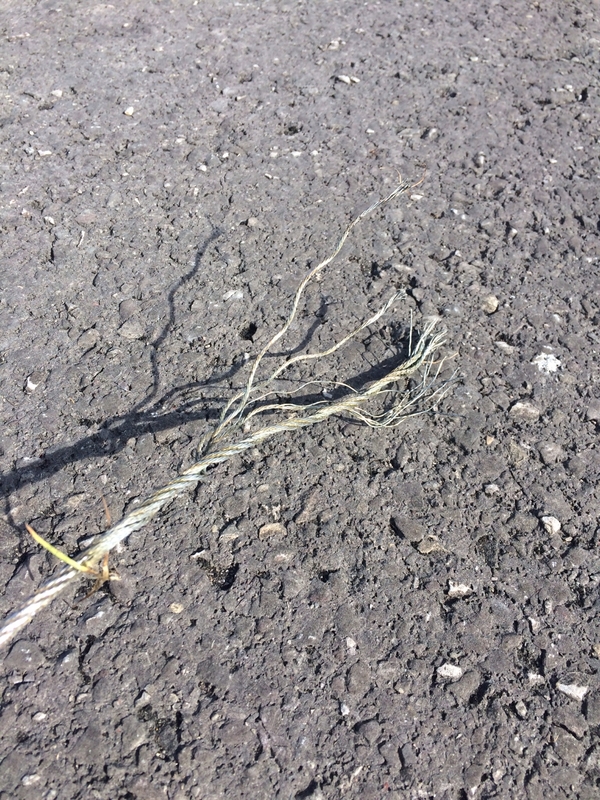 Getting used to the K21, circuit planning, oh and the small matter of my first ever REAL cable break. And boy did I break the cable! (See photo) it was a low level break and those of you who know Aston Down will know that it's fairly easy to make the decision to land ahead. I felt great and it just goes to show that the training really does pay off and natural instinct just takes over based on those eventualities we all go through during our pre flight checks. 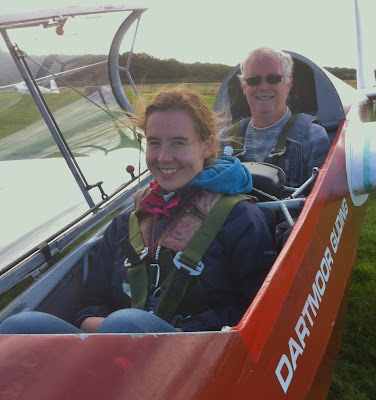 Unfortunately due to the cross wind again, it was decided that going solo would have to wait another day. 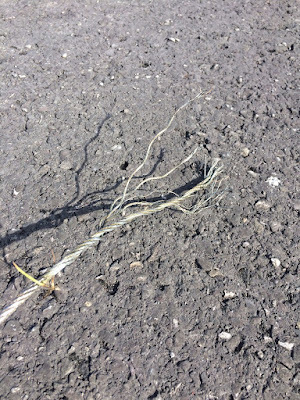 The damage to the cable…oops! Wednesday – today we were flying from the other end of the airfield, the southern end. Last year this was my solo end… Was this a sign? It was also club day so there were a few more faces and gliders at the launch point. 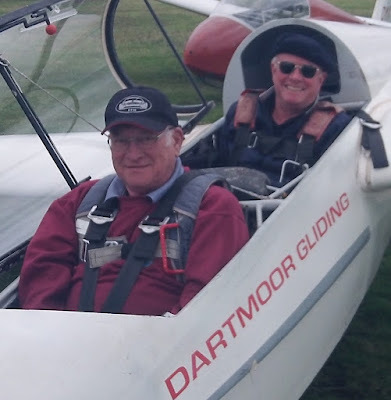 Don and I flew together again a couple of times; he was rather silent on flight 2 and lo and behold, when we landed I was asked “do you want to do that on your own now?” YES!! So it was out with the instructor and in with the ballast. 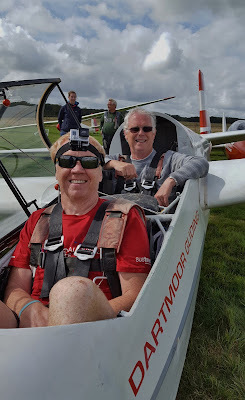 Waiting for the take up slack, I glanced over my shoulder at Dad and he definitely did not look as nervous as the last time I soloed at this airfield! Over the course of the morning, I did quite a few solo flights in the K21, mainly circuits and stalls as conditions weren't anything special. Towards the end of the day, I had a briefing from instructor-to-be Dad on the K23. The short version is that it's a glass fibre K8, so for anyone from DGS thinking about glass fibre aircraft, the K23 is the perfect starting point. 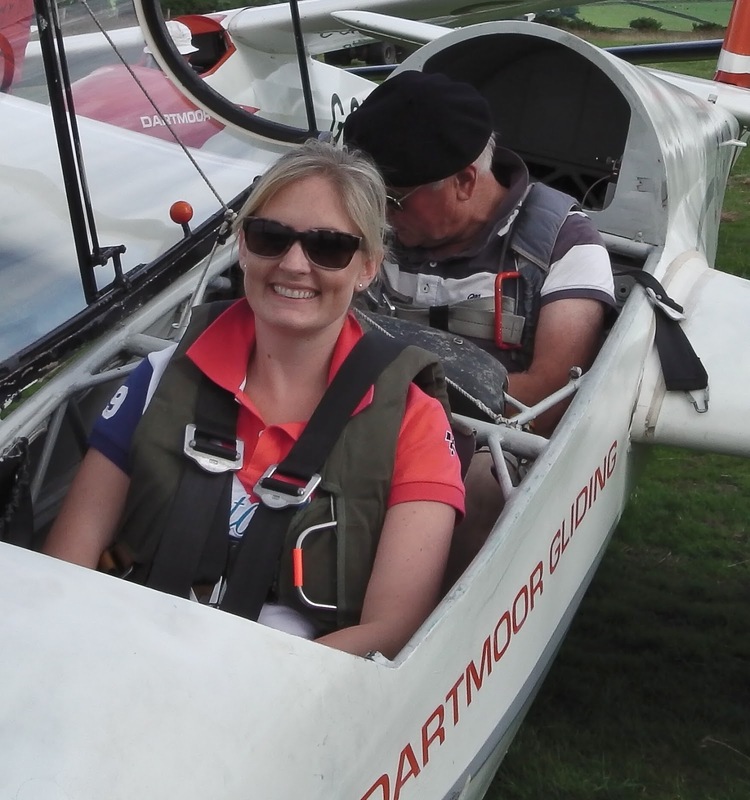 First couple of flights took a bit of getting used to, but by the third flight, I was loving this little single seater. Dad got the chance to fly the ASW19 today too. Peter: Having not flown a glider of this type, I approached Don to ask for a conversion briefing and any other details that I needed to know about flying the ASW19. The reply was, “nothing special to know other than remember it has got a retractable undercarriage”. 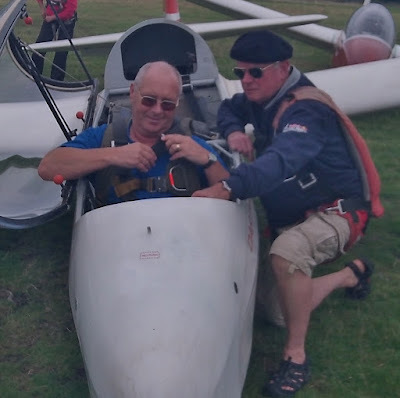 So after a thorough check of the placard and careful familiarisation with the cockpit layout, it was time to pull the glider onto the grid, get strapped in and do my checks. Shortly afterwards I was being pulled up into the air by the Skylaunch winch. 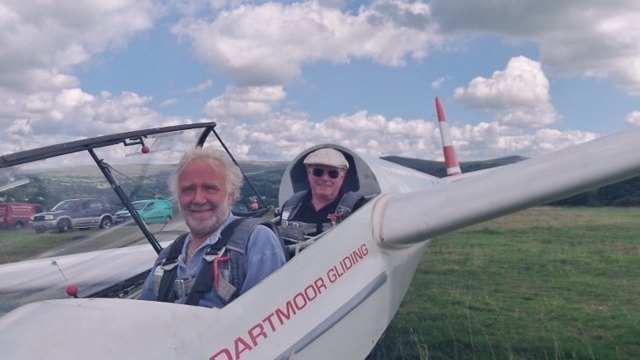 At 1500’ it was wheel up and try to find some lift and get used to flying the glider. No lift found and only reduced sink, but at least I could go further to try and find something. It was soon time to start planning my circuit and landing. So using WULF, I configured the aircraft for landing, putting the wheel down and set off downwind. A good circuit and landing opposite the bus, the first flight was over. The second flight was much the same. I unfortunately didn’t have chance to fly the ASW19 again and have a good soaring flight, but it was a good experience. Dad contemplating the ASW19 cockpit before launching. Thursday – this was the worst day weather wise. Thick fog and drizzle meant there was no rush to get the toys to the launch point. Instead it was a briefing about aircraft limitations and the importance of a reference point during the approach. By late morning cloud base was high enough to get the toys out for some all important circuit practice and further familiarisation of the K23. Before that though, Don set me off on a Bronze C paper to see how I'd fair. Unfortunately I didn't reach the pass mark on a few of the sections but I was pleased with what I achieved given that I haven't done any studying for it yet. Maybe a goal to achieve over the winter perhaps? I then joined everyone at the launch point to explore the conditions: 1200’ cloud base and flights of only 10 minutes. Dad also had a flight with Don aka. Bloggs in the K21 where he had to induce a launch failure and Patter through how to deal with it. Spirits weren't too damp though as we had a lovely roast pork with all the trimmings to look forward to for the course meal. Friday – what a beautiful morning! RASP showed an inversion that would disappear over the course of the day. 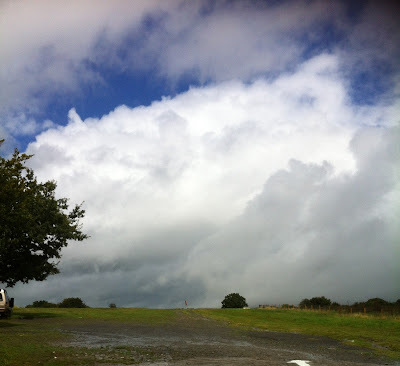 Visibility was 30km, light winds and lots of cumulus to bounce around underneath. The launch point was very busy with club members declaring all sorts of cross country tasks. I've never seen so many gliders queued for a launch, mainly ASW19s and 20s. 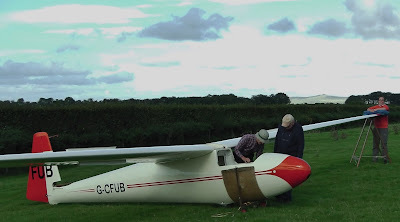 Then came along an Ash 31; a motor glider with a 31m wing span that self launched – what a sight that was! I had three flights in the K23 while it was quiet and could feel that the bubbles were starting to form. But when it came to my turn again, it was so busy at the launch point that I decided not to launch. 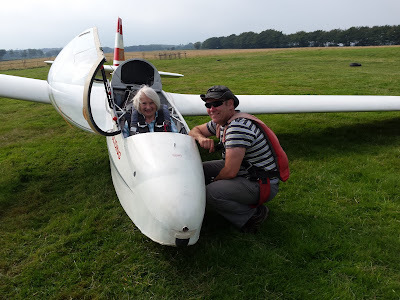 It was fairly intimidating seeing so many gliders, knowing that they all wanted the nearest thermal to go off soaring, and I didn't fancy getting caught up in all of that seeing as I'm new to the skills of soaring. Instead I took myself off to the winch, a lovely Skylaunch winch which I was allowed to have a go at under the guidance of Dave. Waiting to launch in the K23. Waiting until the afternoon to launch paid off massively for me. My next launch took me to to 1500’ off the top of the launch where I hit a fantastic thermal straight away. 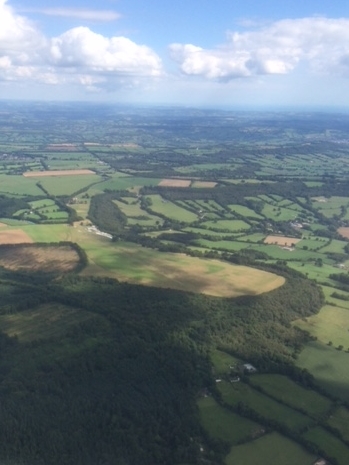 Left wing down and I circled to a fabulous 3,400’ before pushing into wind in the direction of the river Severn. Unfortunately I hit nothing but sink and couldn't find any more lift so it was back down to the ground after 25 minutes. However my next launch was by far the best flight I have ever done. Off the top of the launch I climbed to a massive 3,700’, right up to cloud base. I was beaming at this achievement alone! So I pushed off into wind again but after losing 1000’ I was determined to find some lift again. I turned around to try and find my original thermal. In my 1 o’clock just above me I saw a glider thermaling – there was my thermal! So I joined, turning to the right in the same direction as the above aircraft. “How great is this? !” I thought, and then as I continued with my lookout, I saw below me another glider had joined – this was so exciting! The top glider peeled off as they reached cloud base so I was now the top glider, climbing higher and higher. This must have been the best thermal going (6-8 knots) as before I knew it, another glider had joined just below me in MY thermal! I looked up and there was the cloud – time to leave and explore. I pushed off in a more north westerly direction but once again there was a lot of sink around. A glider was thermaling off to the north east of the airfield so I headed off to join them. This wasn't such an easy thermal to join and it took a couple of turns to align myself in the thermal. By now I was starting to feel tired and I knew I still had the hardest part to do – the landing. It was about half 4 and the thermals were disappearing so I headed off to the high key area to lose height and generally bimble around. 800ft – time to get into my circuit. Back on the ground I felt exhausted, relieved, happy and excited that I had achieved my highest climb, my longest flight of 50 minutes, and longest flight of the day for the course. 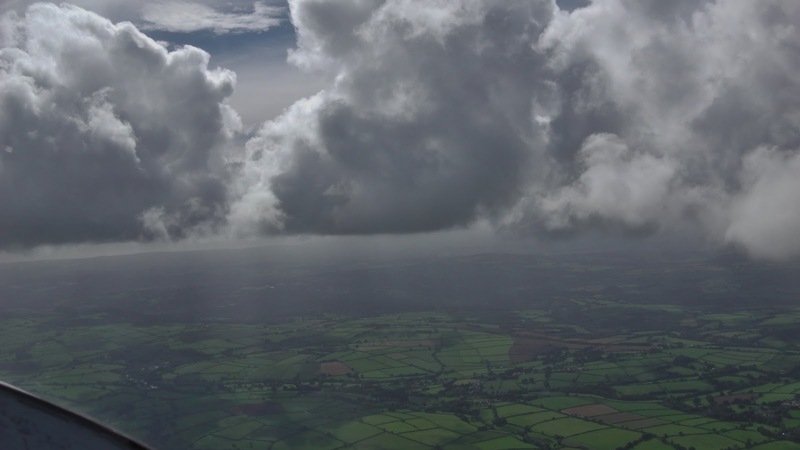 The cloud under which I thermaled to 3,700’ with Aston Down airfield below. Once again, a very successful week at Aston Down. 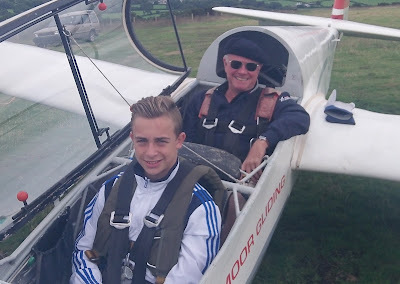 Great experiences and new skills learned to take home ready to fly at our home airfield. I highly recommend to pilots at any stage in their flying career, and I hope by reading this, people will see just how much can be achieved in such a short space of time. After a 1000 briefing in which Gordon Dennis had shown a cloud profile from Penzance to Bristol from OGIMET (some sort of Cornish Met Office?) 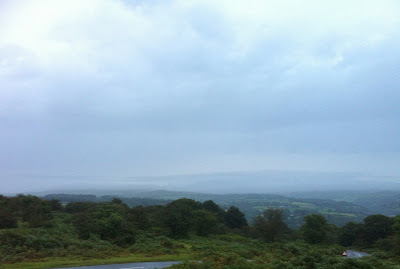 that was completely blue, we were huddled in the launch hut sheltering from the rain! That said, we were lucky to have a launch hut to shelter in since, the first operation of the day, to change ends, had been hampered by over an hour due to a recalcitrant tractor which refused to start (persuasion came in the form of jump leads). 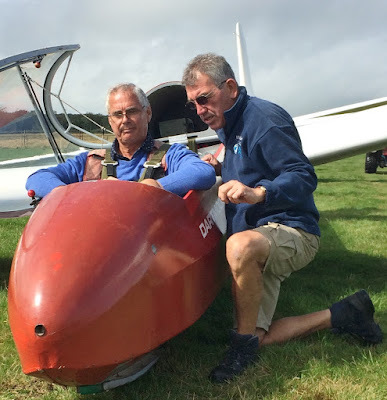 So instead of getting some valuable training flights in before the arrival of a stream of visitors, our trainees had to play a waiting game until much later in the day – which, although part of gliding, is unfortunate and sometimes more than a bit frustrating. Once the rain cleared and the wind steadied from just east of south, thermic activity began to take place. And with came an increase in windspeed and gusts, making final approaches quite tricky and providing some excellent spectator sport! 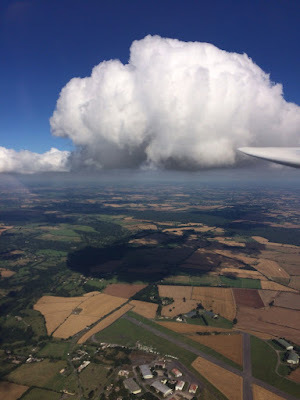 After a couple of re-lights, Roger Appleboom (K-6) managed to find cloudbase at 2,000ft agl (see photo), and set off for Okehampton under cumulus that was beginning to street. Once there he very wisely decided not to push on, and began a very long row back to base. The view from Roger Appleboom’s cockpit at 2,000ft as he headed for Okehampton. Meanwhile, Robin Wilson (also K-6) discovering that the sinky bits were more prevalent than the lifty bits, very wisely decided to make his first field landing just to the west of the airfield - an willing crew was quickly mustered to assist in his embarrassment! Robin Wilson and Allan Holland de-rig the K-6 after Robin’s field landing. Our visitors included One Day Course medical student Georgina Covell, James Inchley, Steve Wickenden (his SEVENTH rebooking..! 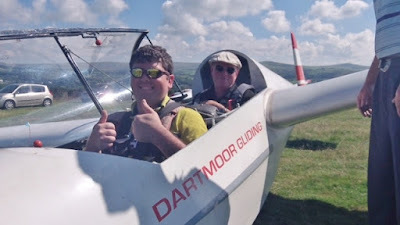 - Voice of Dartmoor Dave Downton was very happy to strike him from the list..!) and Tim Baxter. One Day Course visitor was medical student Georgina Covell. Visitor Tim Baxter with IFP Peter Howarth. Visitor James Inchley being briefed by Martin Cropper. As has already been said, our trainees, including Ben Caverhill and Callum Doyle, had to wait until the dying embers of the day for their training flights and deserve to be thanked for patiently helping out around the airfield whilst awaiting their turns. At the other end of the airfield, Paula Howarth received winch training from Rick Wiles, whilst Barry Green and Heather Horswill also provided the end-to-end supply chain of launches and cables. 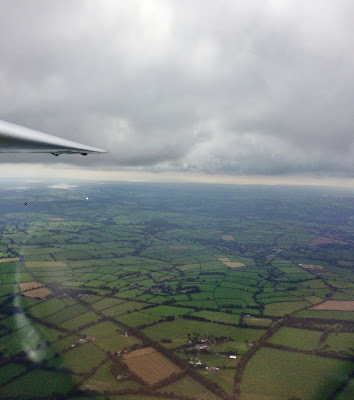 Saturday started with low cloud at 700 feet but with the promise of the cloud clearing as the day progressed and it did with launches up to 1300 feet by midday. With 5 trial flights booked I was kept busy. 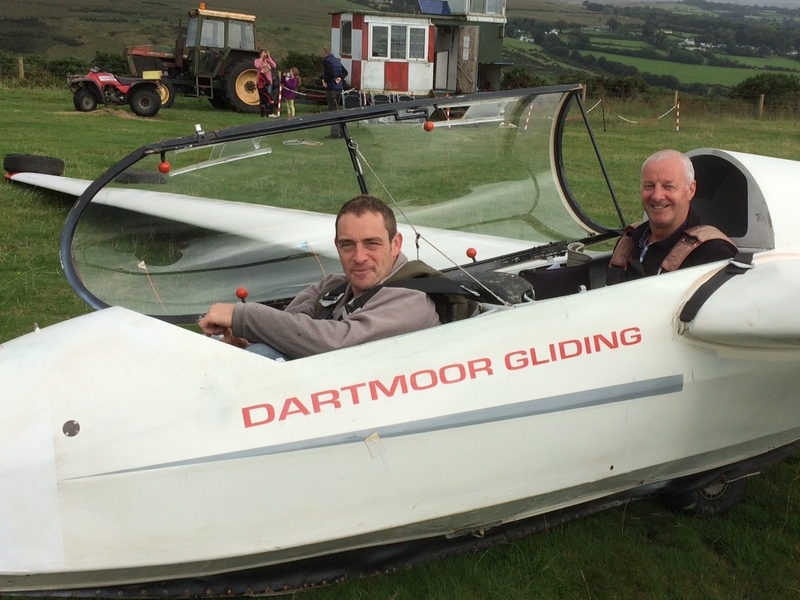 One guest had traveled from as far a field as Weston-super-Mare to fly with us. And finally visitor George Williams. 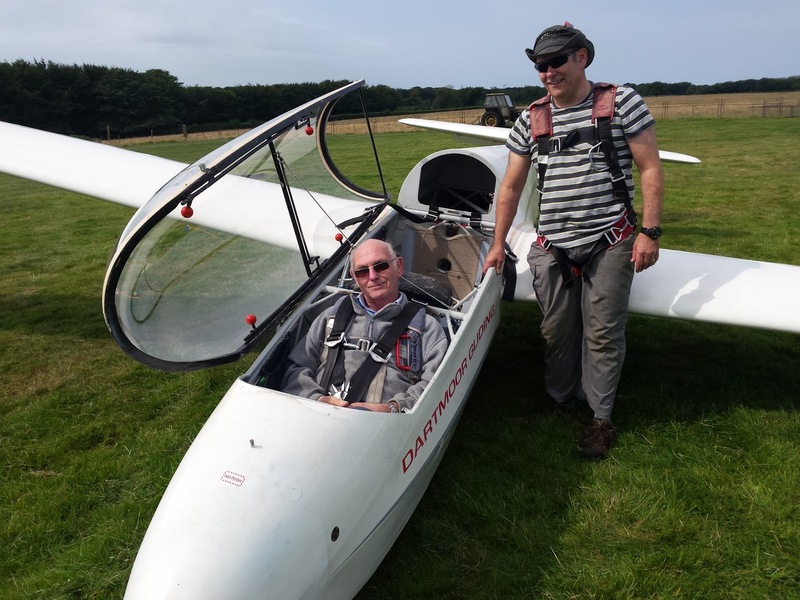 New club member Sefton Greene was introduced to the basic controls of a glider whilst Instructor Ged was busy flying with Mike Bennett. Light thermals produced a 21 minute flight for Barry Bilton from Weston did it Martin Broadway to take a flight in the Zugvogel ? Member numbers were low so every body was busy through the day. 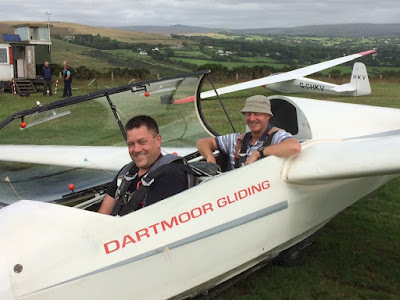 Looking after the launches were Steve Raine and Mike Bennett. 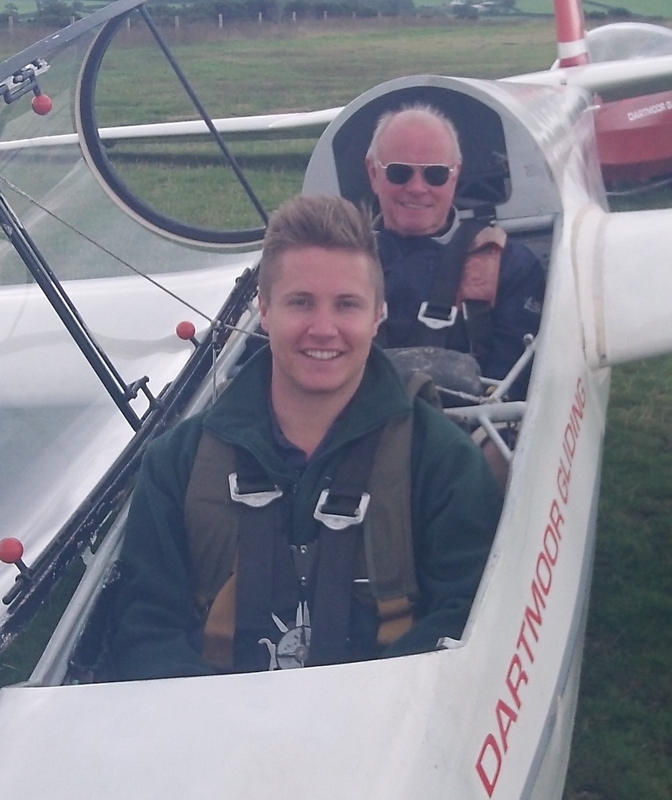 Steve finished the days flying with some IFP rear seat flying practise. It wasn't all over until the committee meeting finished at around 8pm. A productive day and thanks to all who made it so. After yesterday's atrocious weather at least the forecast for today was dry with, if the BBC was to be believed, a wink of sunshine between 2-3pm. 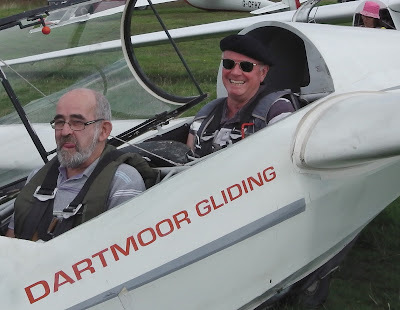 Well that never happened but at least we were able to mount a full day's flying programme, including a One Day Course, four 'trial lesson' visitors and at least 3 club trainees. Cloudbase was a little challenging at start of the day (1,200ft agl), but rose steadily to peak at 1,500ft around lunchtime, when some gentle thermals could be found by those sufficiently sensitive to detect and make use of them. Hence Flight of the Day went to Paula Howarth (flying with ballast in the back seat), closely followed by IFP Roger Appleboom. The Tors wreathed in orographic as the evening drew in. Our One Day Course student was Dan Tofield. Other visitors included Greg Sleeman, Matthew Bamber, Allan Lee and Allan's grandfather Mike Wonnacott. 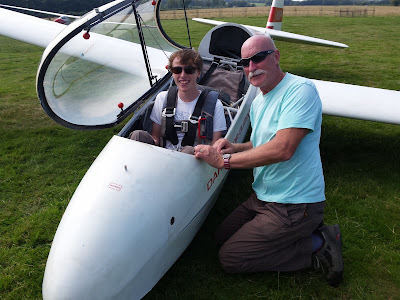 Thus whilst the launch rate barely exceeded 4 launches per hour, the overall total of 28 launches was not to be sneezed at, shared as it was between our two hard working K-13s, with no sport sailplanes (ie. single seaters) taking advantage of the improved weather. 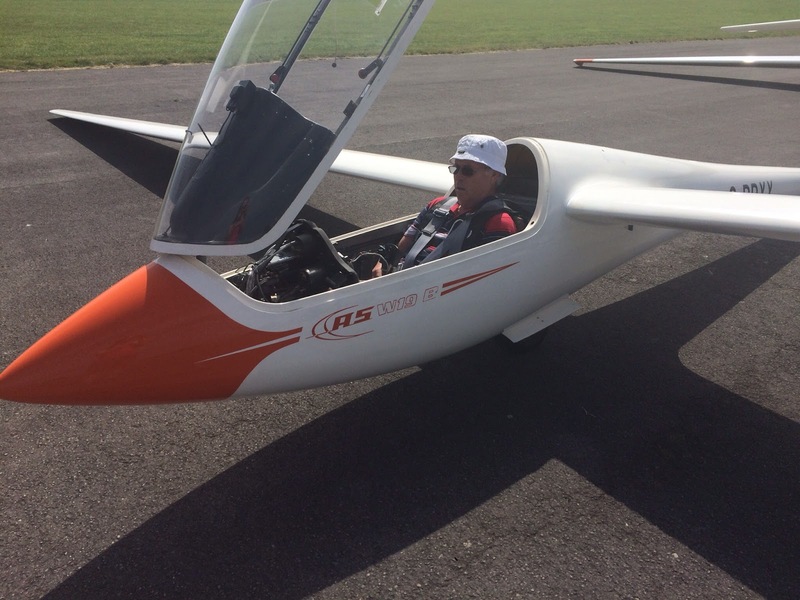 Allen Lee flew with IFP Roger Appleboom. With thanks to Barry Green and Heather for providing a faultless winch'n'retrieve service for much of the day, at about 6:45pm we retired to the clubhouse with a certain sense of satisfaction that everyone had flown and nothing broken. PS. By the time you read this we will be sending congratulations to returning member Dave Parker. 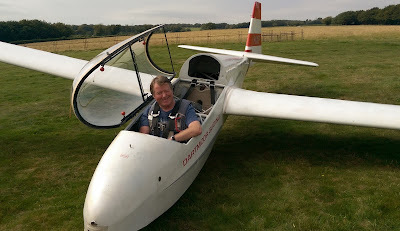 Dave, who was forced onto the subs' bench of the Sunday Soarers due to ill health, will by now be sunning himself on honeymoon in Mauritius, having recently bought himself a Standard Cirrus as a wedding present! There are a number of comments that could possibly follow - but over which we will rapidly conclude with a hearty...All the best, Dave! 745am The early risers were keen to get going. Forecast was a best guess. If the temperature got high enough it would be a good day.....and it was. 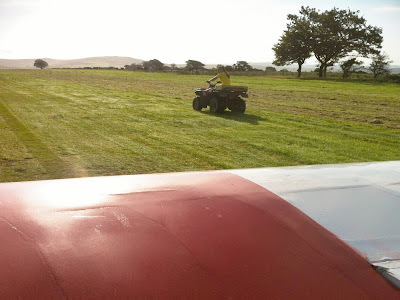 845am The Kit was readied and Rick gave the grass runway a quick trim before flying began. A pre flying meeting at the clubhouse at 930 was called by Gordon , this refocused all our minds on hot topics of Safety, weather, planning, training and some of the days objectives, namely a one day course and three one flight trial lessons This I found a worth while 10-15min chat so we all pulled in the same direction (something I feel will become a regular feature like at so many other clubs) the chat I mean ,not the pulling in the same direction. One k13 was reserved for instructor training. Thanks to all who facilitated this as we all understand how important this is for the clubs progression. 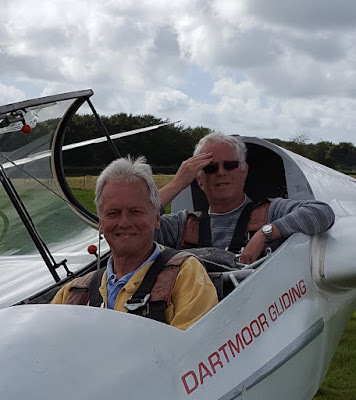 As on most good soaring days the early part of the flying list was progressing well, while the solo pilots stood looking skywards pointing upwards and chatting in technical double dutch. Chrys Ward was one of today's visitors on the One Day Course . He was treated to the sunshine bank holiday of the year, oh and some gliding. The visitors had fun by the looks of it. 1245- The private gliders started to interject on the launch queue, and the hour and two hour flights were beginning. Summers here! I slipped away in the k6cr about 1:30pm for a stab at a cross country and had a trip to Northill and back. The fluid fly wheel on the winch got all hot and bothered, a straw poll followed at the launch point if we waited the required 1-1.5 hours to cool and sort or to return home at a reasonable time on a good flying day and get brownie points with loved ones. This was a unanimous decision, even the two pilots strapped in the k13 waiting to launch agreed!!! Today was a day of questions, not least being would Roger Appleboom's friends from Taunton - motorcycle examiner Adrian Troake, driving examiner partner Leanne King and her son Warren be able to fly today? With low cloud and gravity assisted H2O in issue early on, clearly that would not be possible at the start of the day (see photo), but was there the possibility of a clearance later on? ...until at about 3pm a blue hole appeared – but it didn’t linger. The predicted clearance did indeed appear (as captured in the photo) at around 3pm; it didn't linger, however, and by 3:15 we re-entered the loop of the occlusion's low cloud. 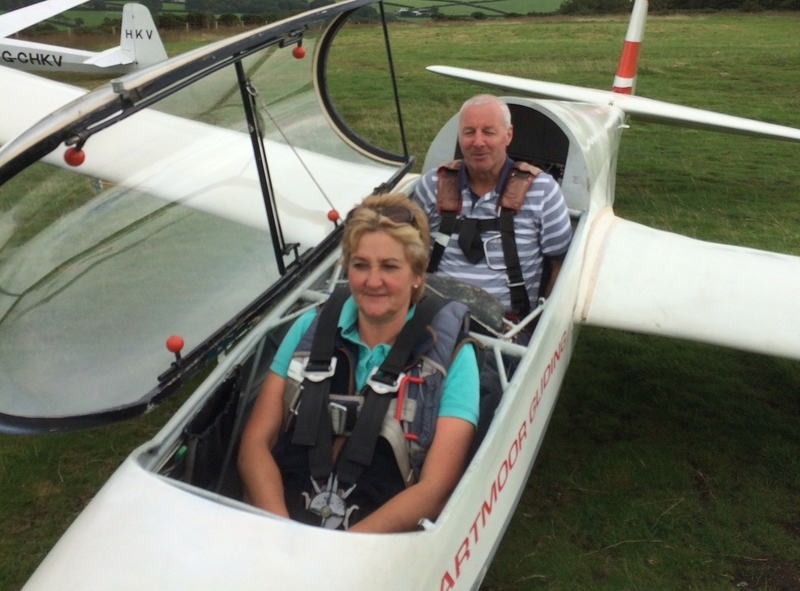 So Adrian, Leanne and Warren didn't get to fly, however they rebooked for another day and departed with a newly acquired set of knowledge about gliding they could never have expected on arrival! After yesterday's sunny, thermic conditions today stared as a bit of a disappointment with heavy cloud cover and the wind forecast to be mostly southerly. Despite this, the airfield was going to be busy. The surprise was that the wind was actually easterly. Regular readers will know that an easterly wind can bring us good wave flying conditions and is guaranteed to raise the pilots expectations. Right from the first flight there was signs of wave with nearly all flights sustaining for 10 to 12 minutes or so in weak wave conditions which allowed the aircraft to maintain height for short periods. There was signs of rotors particularly on the final turn and approach but thankfully this was also weak. Longest flight of the day was only 18 minutes. Towards the end of the afternoon the wind suddenly veered to the south which seem to trigger new wave conditions laying east-west instead of the north south wave bars that the easterly wind produces. We have no idea what the trigger for this wave was. South Coast maybe?. 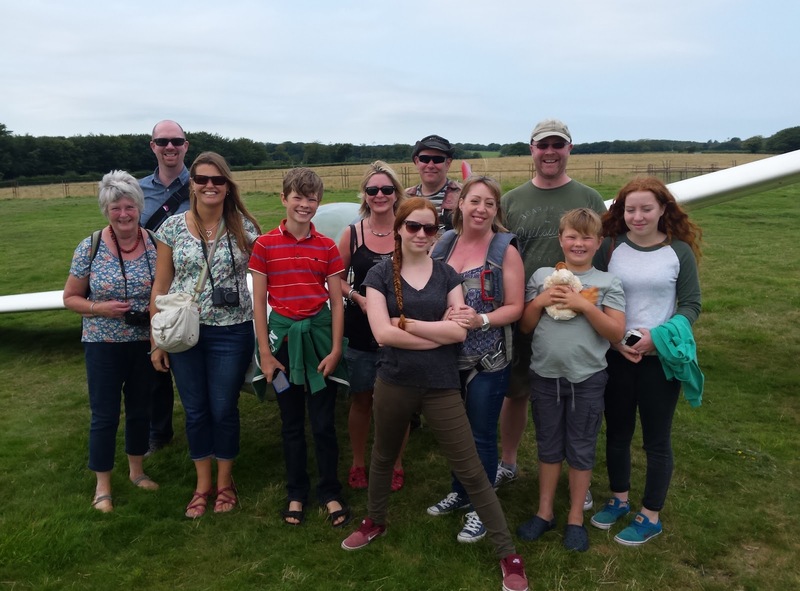 We welcomed several visitors today with Tom Bevan on a One Day Course and Freda Welton, Brendon O'Keefe, Freddie Kelly and Lisa Pike attending for Introductory Flights. 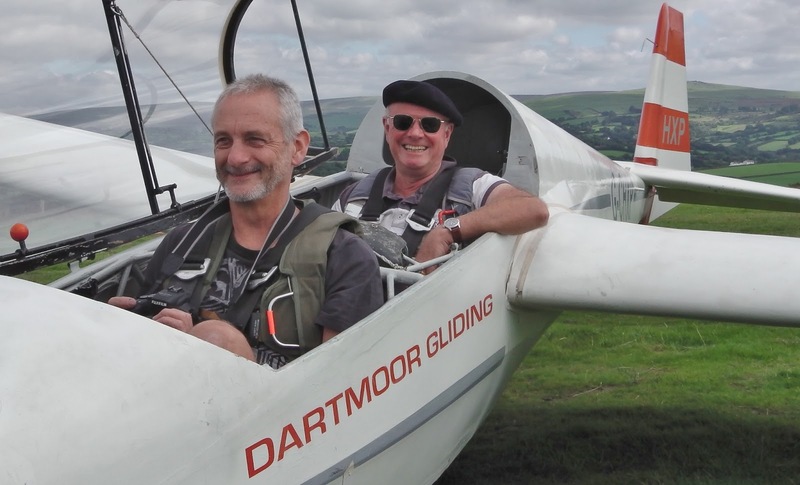 Our visitors were flown by a combination of Rick Wiles, Ged Nevisky and myself ( Steve Lewis ) using K13 G-CHXP while Gordon Dennis continued the club training effort in K13 G-DDMX. Thanks today to all those who helped make the day go as smoothly as possible.